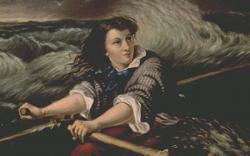 At this time of appalling weather it seems right to remember Grace Darling as our hero of the week. A Victorian child naming a British heroine would cite Grace, born during this week in 1815; today some vacuous ‘celebrity’ would be proferred. But Grace Darling’s heroism was very real, and very physical: in 1838 she risked her life in horrific weather rescuing nine survivors from a shipwreck off Bamburgh, rowing to their aid with her father. As with contemporary starlets her depiction by the press was distorted – she was drawn rowing in billowing and demure crinolines; and as so often her fame became a burden, though briefly as she died of tuberculosis just four years after her heroic feat.